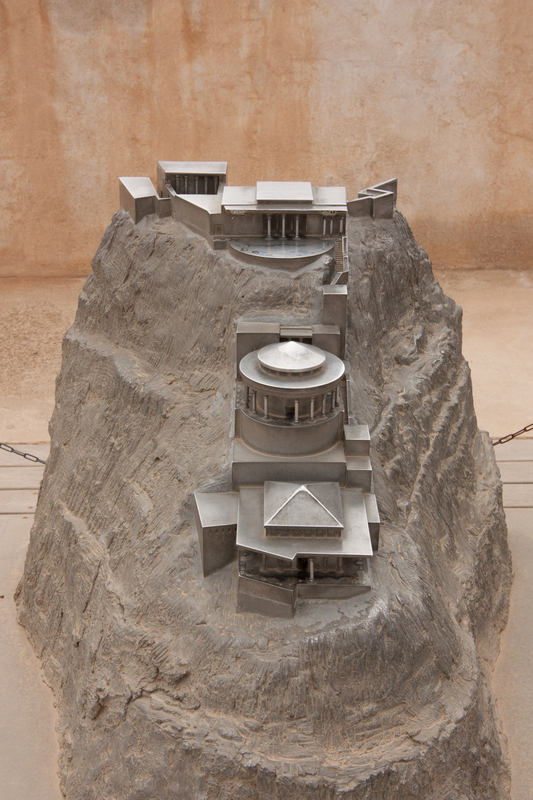 Masada was an impregnable fortress built by King Herod at the top of a high mountain in the desert near the Dead Sea. Herod equipped his fortress with food and supplies that could last years and engineered an aqueduct and cistern network to store limitless water for Masada’s defenders. After the Jews had been dispersed from Jerusalem in 70 AD, a remnant retreated to Masada as a place of safety where the Romans couldn’t touch them, but they underestimated the fury of the Roman command who purposed themselves to destroy the Jews no matter how long it would take. Where the Jews saw Masada as a sanctuary, the Romans perceived it as a trap which the Jews could never escape. Now that it was relative peace-time, the Roman legions used Masada as a military exercise, a test of their military strategies to overcome the unassailable fortress. They studied and waited and brought in thousands of slaves to work around the mountain, eventually constructing a siege tower and a ramp up the mountain to haul the tower to Masada’s high walls. Once it became clear that the Romans were about to overrun them, the Jews decided that death was their only escape from slavery. They appointed ten men to murder their own and everyone else’s family members, men and women and children, and one man to kill the other nine and finally commit suicide. The Roman army broke through Masada’s walls only to find no resistance with almost a thousand Jews lying dead with their friends and families. You can imagine the spiritual sadness we felt as we stood at the broken walls of Masada where God’s first people died in this terrible kind of defeat. Masada represented hope to the ancient Jews, but hope destroyed to the people of modern Israel who are determined to never be in that no-win position again. It’s ironic then that Israel itself is a place of final retreat where Jews from every nation have gathered for a last stand against an increasingly hostile world…a kind of modern Masada. But our Israeli tour guide, Danny Cohen, described himself as an ambassador for Israel with a mission to reach out beyond his home for support from America’s Christians. Israeli’s know they can’t prevail as an isolated people, so they’re reaching out to the only faith community that can provide reinforcements. That’s what Masada has taught the Jews. There is another lesson from Masada for Christians though. While the Jews of the first century were isolating themselves at Masada, their fellow Jews – the first Christians – did something very different to defeat Rome. God’s Holy Spirit led Christians to disperse and infiltrate the Roman Empire. So successful was the strategy that Christianity gained control of the Empire within three centuries, although it would take more than another millennium for true Biblical Christianity to become ascendant. The modern day warning is that the Church has lost its way a bit. Rather than continuing to infiltrate our culture, we are retreating from it. We have become proud of our church buildings and our separate-but-equal cultural achievements like Christian music, Christian radio, and Christian movie-making. Our best and brightest youth gravitate toward ministry within the Church instead of Godly entrepreneurship and evangelism into the world. We mustn’t be retreating into our Masada-like fortresses waiting for evil-doers to overtake us. We should instead be infiltrating the culture around us to champion the truth of God to people who will otherwise lose their way and lose their souls. Remember the lessons of Masada!